We are Stephen and Ginger Jordan, along with our four children: Rebekah, Abigail, Luke, and Jonathan. Both of us, Stephen and Ginger, were led into missions during our teen years. 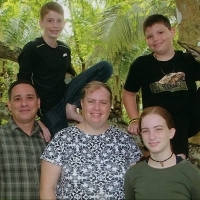 We met at the New Tribes Bible Institute in Jackson, Michigan, and were married in 1995. God led us to the Philippines in 2000 as Church Planting missionaries. We moved to the Philippines in 2000 and lived in Manila for two years while we studied the national language and culture. Since 2003, God has given us the privilege of living among and ministering to the Agutaynen people in the Philippines. We spent the first few years learning the Agutaynen language and culture. In June of 2009, our team was able to begin teaching the Agutaynens the Bible in their own language. Praise the Lord with us that many Agutaynens have put their faith in Jesus alone for their salvation. Our ministry will continue to center on Church planting as we desire to see these believers growing in their faith and other Agutaynen villages reached for God’s glory. The Agutaynens are a group of about 20,000 people living on and around the Island of Palawan in the Philippines. The Agutaynens are one of many groups in the Philippines that have their own language and culture. Primarily, they are fishermen or rice farmers.